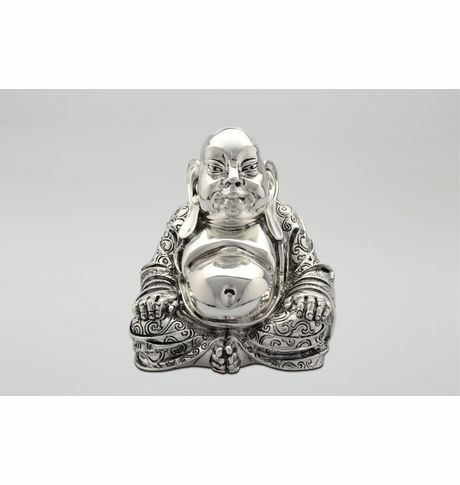 Big Belly Buddha idols depict a stout bald man in robes with a largely exposed pot belly stomach, which symbolizes happiness, good luck, and plenitude. This is an excellent masterpiece with silver vacuum plating and antique finish. It can be an ideal gift. Dimension: 12.5 x 14H Art. Big Belly Buddha idols depict a stout bald man in robes with a largely exposed pot belly stomach, which symbolizes happiness, good luck, and plenitude. This is an excellent masterpiece with silver vacuum plating and antique finish. It can be an ideal gift. Dimension: 12.5 x 14H Art. Cancellation and Return Policy: • Exchange allowed post booking • No order cancellation or Refund transaction allowed at the store.